A number of people sent facebook comments, tweeted, or sent emails saying they enjoyed my comments about book cover design and how we showed in our last BookNotes post some jackets that we think worked well. I chose non-fiction books from Christian publishers; I not only highlighted some good design work and revealed a bit of my own tastes, I guess, but it showed the real variety of publishers we appreciate. And the variety of ways to do book covers well. There are, as we said, a bunch of “best covers of 2011” lists out there, and some of the mainstream publishers have done stunning work. You can find those that are widely recognized and hope you do. Cover art and jacket lettering–and, increasingly, the inside design–is a vital part of the real book experience. As I’ve often said, the size and shape and feel of a book matters, too, for a pleasurable reading experience. Of course the old adage that “you shouldn’t judge a book by its cover” remains true, but that is not to say we shouldn’t judge the cover. I sometimes say that whoever coined that truism must never have tried to sell books, because people do. All the time. So, here are just a few from mainstream, general market publishers that I pulled off our shelves or have stocked at some point this year. They are a few of my favorite covers this year, mostly non-fiction. Enjoy. Sweet Heaven When I Die: Faith, Faithlessness, and the Country in Between Jeff Sharlet (Norton) $24.95 cover design by Mark Melnick Not only is this just about the best-written book I’ve read all year, I love the cover. It may seem a bit busy, but on closer look, the rugged terrain and the picture on the billboard just strikes such a chord. My Dyslexia Philip Schultz (Norton) $21.95 cover design by Mark Melnick I didn’t realize it until I checked to type it just now, but this is the same designer who did the Sharlet title. A very different use of color hue on the typography, very different fonts, an obviously very different feel. The way the author’s name and the notation that he is a Pulitzer Prize winner are all arranged, it almost gives the sense of being dyslexic, but it isn’t misspelled, which would have been a too-obvious, cheap move. The upside down title on the spine, though, is a wild touch that really works. A very, very moving book with a very creative but classy cover. House of Prayer No. 2: A Writer’s Journey Home Mark Richard (Nan A. Talese/Doubleday) $23.95 cover design by Michael J. Windsor Nan Talese’s imprint is impeccably prestigious, or so I gather, so the writing would not only have to be top-shelf impressive (it is!) but the cover would have to be excellently executed. The hectic scribble, the nostalgia of an old photo, the color, the print sizes, the odd font choice all are well suited for this allusive title. What the heck is the “house of prayer no. 2?” The look is maybe a bit edgy, a bit risky but it works. This is one of my favorite memoirs of the year and one of my favorite covers. Peace Meals: Candy-Wrapped Kalashnikovs and Other War Stories Anna Badkhen (Free Press) $25.00 Cover design by Eric Fuentecilla I may wax eloquent about this foodie travelogue through war zones later, but the juxtaposition of the worn, soiled hands, those lovely little fruits, and the lacy tablecloth makes this a very evocative cover for me. Love it! I wish the back jacket was a bit more interesting, but don’t you love that photo by Spencer Platt? Kudos. The Age of Persuasion: How Marketing Ate Our Culture Terry O’Reilly & Mike Tennant (Counterpoint) $16.95 cover design by Michel Vrana What can I say—a perfect cover with the Mad Men allusion, the hip colors. I don’t even know what this kind of high-contrast, silk-screened-like art is called but it is instantly recognizable. Am I wrong? Cool, man. Fair Food: Growing A Healthy Sustainable Food System for All Oran B. Hesterman (Public Affairs) $24.99 cover design by Brent Wilcox As I looked through our section on food, sustainable eating, and such, a few really bad ones stuck out. (One had a pile of dirt on a dinner plate, which made, uh, some kind of point, but it was just weird, as good as the book was.) This, though, used food in the typography without being corny (sorry.) I noticed the heft of the book, the good stock on the dust jacket and excellent binding; the playful cover stands out, even on the spine. Do you like? 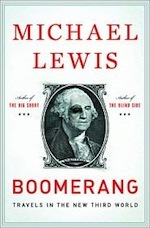 Boomerang: Travels in the New Third World Michael Lewis (Norton) $25.95 cover design by Darren Hagar When I saw this in the publsiher’s catalog it only registered as yet another boring-looking book about economics and public affairs. It’s Michael Lewis, though, a fantastic writer (The Blind Side, The Big Short) so of course we ordered it in. When the book arrived, I looked more closely at the black eye old George was given and it made me laugh right out loud. It isn’t overstated but once you see it, it changes everything. Presentation Zen: Simple Ideas on Presentation Design and Delivery 2nd edition Garr Reynolds (New Rider’s Press) $29.99 cover design by Garr Reynolds There was a second edition this year of this classic book on how to use PowerPoint more artfully and effectively and it presented the publishers with a common problem: how to do a 2nd edition? A whole new cover suggests a whole new book. The words updated or new edition are cumbersome. I loved the way they used the sticky post-it note here—which certainly fits the genre of a business book. It doesn’t distract much from the zen-like qualities of the cover, but–I’m supposing–they realize it is, after all, a book jacket cover, not a photography for an meditation center. A nice example of commercial art that is clever, that gets the job done, and remains artful enough. The author, not surprisingly, by the way, designed the cover. State of Wonder: A Novel Ann Patchett (Harper) $26.99 cover design by Archie Ferguson Nate Duval deserves special credit, too, for doing the impressive jacket illustrations. When an author is one of the most acclaimed of our generation, we would assume there is quite a budget (and quite a struggle) to get the design just right. From the deckled pages to the warm yellow flyleafs, the whole package is solid and lovely. But this artwork, the intricate dragonflies (on front and back) and the edging which brings to mind Pennsylvania Dutch fraktur, sets the book apart, especially in a year full of the hip, minimalist, stark, and postmodern. A Chicken in Every Yard: The Urban Farm Store’s Guide to Chicken Keeping Robert & Hannah Litt (Tenn Speed Press) $19.99 cover design by Chris Hotz/Nemo Design I mentioned that I wasn’t sold on the funny cover of the great Joel Salatin book, the one with the chicken next to a giant egg. Great book but dumb cover. If you’re going to use a chicken on a book, I think this one works better–it somehow brings to mind an old union poster with that metal, industrial bridge and gray skyline. The inside, by the way, is a treat to behold, with art ranging from vintage New Yorker type illustrations to full color photos of the lovely bird in action and bunches of vivid farm scenes. The Other Walk: Essays by Sven Birkerts (Graywolf Perss) $15.00 The artsy Graywolf is a perfect publishing home for this eloquent essayist, whose memoir and considerations about print culture and books are essential reading. The textured cover on this paperback is nice to the touch, and the black and white photo is excellent, even if a bit odd. The simple text in a line across the top reminds me of old City Lights poetry books. I suspect it has some allusions to previous publishing looks. Arctic Autumn: A Journey To Season’s Edge Pete Dunne (Houghton Mifflin Harcourt) $24.00 cover design by Martha Kennedy I know it is sort of cheating to choose books with close up nature photos, but this design–a broad horizon scene and a close up of the polar bear is such a nice combo, I wanted to show it. The book is a travelogue, so it has to make you want to go there, or at least read about going there, right? Further, it is the third in a series, each with uniform covers, and I like those sorts of projects. The others aren’t exactly the same, either, but do stand together, quite nicely. See his Prairie Spring and Bayshore Summer. Wonder what the fourth will be? I’m sure it will have a great cover. Praying for Strangers: An Adventure in the Human Spirit River Jordan (Berkley) $24.95 Okay, maybe it is just me, but I love the earth tones, the lower case letters in the title, (and the way the words are arranged.) I guess these dots are blurred headlights, but I’m not quite sure. There is color, but it is muted, evoking the mystery that is at the heart of this lovely memoir. It is a slightly smaller sized shaped, too, making it perfect to hold. Kudos. Joining the Resistance Carol Gilligan (Polity Press) $19.95 cover design by Office of Paul Sahre This is a good example of a minimalist approach; no subtitle, the sans serif font, the singular raised hand. Notice that it is not in an obvious “speak to the hand” sort of nay-saying gesture, as you might expect, but just raised—making it what Cal Seerveld would call “suggestion-rich.” The designers left most of the back and the back inside flap nearly blank, which I guess was intentional, but seems overly sparse with being striking. Maybe they should have gone the whole way, like the first hardcover all-white edition of Rob Bell’s Velvet Elvis. Anyway, it is good to see scholarly presses doing creative design along with the heavy prose. The Blind Contessa’s New Machine Carey Wallace (Pamela Dorman Books/Viking) $23.95 cover design by Kelly Blair I noted in a previous BookNotes column just how lovely to behold this small hardback is. The paperback is just now out with a great, new look, but the hardcover deserves to be seen again. The story is about an 18th century Italian woman going blind, whose assistant invents a typewriter. Ahh, but this allusive, inviting cover says nothing of that. It still is a grand, artful cover, for a very beautiful novel. The Information: A History, A Theory, A Flood James Gleick (Pantheon) $29.95 cover design by Peter Mendelsund What to say about this? I tend to think that Pantheon has some of the strongest, contemporary covers in the industry, and this remarkably important, master writer has given us another major highly-acclaimed work of brilliant non-fiction. The cover speaks volumes–although this thumbnail copy is missing an entire column of, well, information, so fails to do it justice, as the words flood over the jacket. And you should ponder the back, too, which, in a few inches in the upper-right hand corner, offers a hint about the history of print. Interesting, at least. What do you think? Lucid Food: Cooking for an Eco-Conscious Life Lousia Shafia Ten Speed Press) $22.50 cover design by Toni Tajima I wish the reproduction here captured how bright these close up photos are. Again, it is nearly cheating to use close-pictures of food and there are so many truly beautiful covers in the cookbook category (ohh, we should have a category of best cover designs for books about chocolate!) Still, this eccentric title not only uses great pictures but shows what I think is fabulous book design—the long stems on the right are so properly arranged and their bright color pops and the excellent choice of font and the arrangement of the text. So intriguing…I had to include it as one great example of many in this genre. The inside is a knock-out too. What a treat.